Currency traders watch computer monitors near the screen showing the Korea Composite Stock Price Index (KOSPI) at the foreign exchange dealing room in Seoul, South Korea, on June 23, 2016. Asian shares were mixed Thursday ahead of a vote on whether Britain will opt to remain in the European Union. In volatile trading, Asian stock markets fell sharply on Friday with Tokyo stocks, U.S. futures and oil prices plunging as the early results in Britain's referendum challenged the earlier anticipation that Britain would remain in the European Union. Stocks and currencies took a wild ride amid mixed indications about the Britain's vote results. Polls had suggested a "remain" victory but initial results were showing a tight race, causing the British pound to seesaw wildly. With one-third of results in, voters seeking a British exit, or Brexit, from the European Union were leading the voters who supported remaining in the union. Tokyo's Nikkei 225 finished the morning session 3.1 percent lower at 15,742.40. 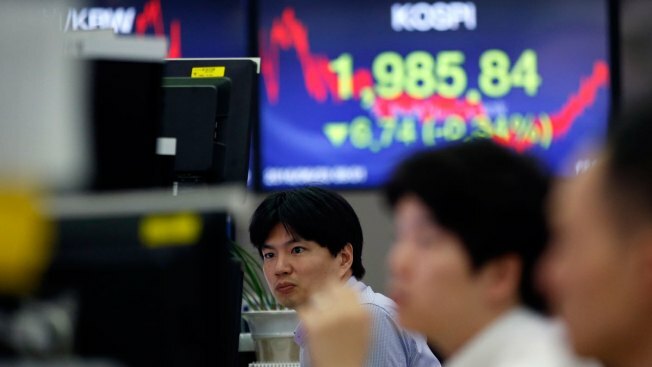 Seoul's Kospi sank 1.7 percent at 1,950.99. Australia's S&P/ASX200 slipped 1.9 percent to 5,178.70. Hong Kong's Hang Seng index fell 1.6 percent to 20,537.10. Stocks in Shanghai and most Southeast Asian markets were lower. U.S. futures indicated investor jitters. S&P futures plunged 2.4 percent while Dow futures sank 2.4 percent. Wall Street closed with rallies on Thursday before early results came in. "The contest looks to be more closely fought than thought," Mizuho Bank Ltd. wrote in a daily commentary. "Given the pattern of voting, we think a surprise 'Brexit' outcome is a very real possibility at this moment." The first results, from England's working-class northeast, showed a smaller-than-expected "remain" win in Newcastle and a bigger-than-expected "leave" vote in nearby Sunderland. The "leave" side also outperformed expectations in other areas of England. As vote counts progressed, the "leave" side gained strength. The first four results from Wales have shown majorities for the "leave" camp, flagging further warning signs for the "remain" camp. Analysts expected increased volatility in currency markets. The dollar weakened sharply to 100.86 yen from 104.80 yen while the euro slipped to $1.1095 from $1.1318. Crude oil prices tumbled as the "leave" side led the "remain" camp. Benchmark U.S. crude lost 3.8 percent, or $1.92, to $48.18 per barrel in New York. Brent Crude, the benchmark for international oil price, fell 3.9 percent, or $1.99, to $48.98 per barrel in London.